For the uninitiated, Balkan Beat Box first burst out of New York City’s underground music scene in 2005, with a self-titled debut that introduced the world to their Mediterranean-inflected, globalized electronica sound. Founded by Israeli-born ex-pats Ori Kaplan (ex-Gogol Bordello), Tamir Muskat (ex-Firewater), the band built their reputation on explosive live shows. 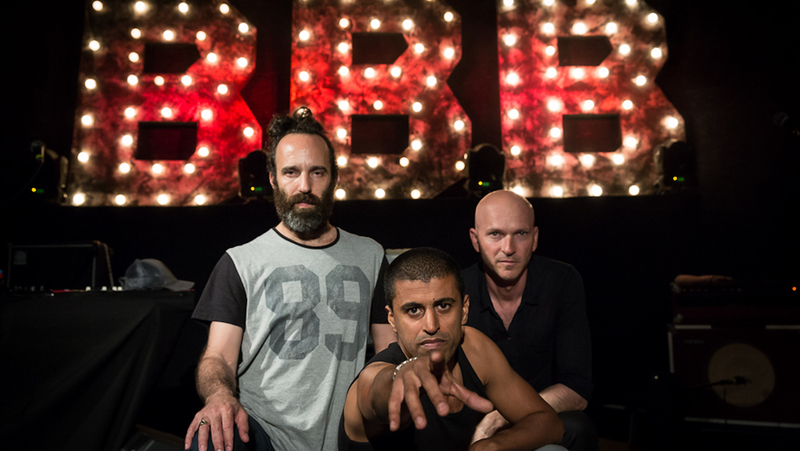 BBB soon added frequent collaborator Tomer Yosef as frontman – his wild onstage energy galvanizing live audiences ever since. The three emerged as a cohesive songwriting trio on 2007’s Nu Med – Tamir crafting hard-edged beats, Ori orchestrating melodies and Tomer writing the hard-hitting lyrics – and took their sound to Belgrade and other points East on 2010’s Blue Eyed Black Boy. Inspired by last year’s people’s protest movements across the globe – from the Arab Spring, to Occupy Wall St., to Israel’s own massive social protests Balkan Beat Box’s new album Give captures the cautious hope and re-energized spirit of our time. Brimming over with handcrafted beats and samples, and recorded primarily at Tel Aviv’s Vibromonk East studio, Give was conceived of as “a smaller, more introverted album,” according to Ori Kaplan. “It was fun for us to see what just came out of the three of us while we played with old analog synths and children’s toys”.